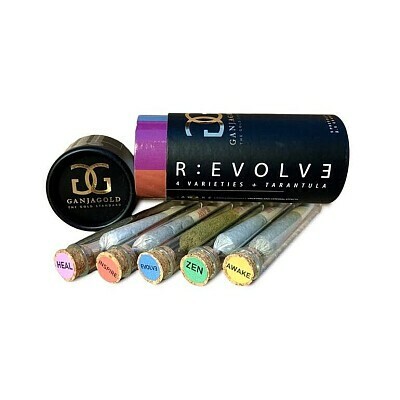 GANJA GOLD- R:evolve Pre-Roll Pack PreRolls, Order Weed Online From East Of Eden Cannabis Co.
Five distinct pre-rolls for five distinct moods. Experience Zen, Awake, Heal, Inspire, and Evolve to find out what all the buzz is about with this pre-roll pack and unleashing the GanjaGold flavors. Wow Your Senses with R:EVOLVE. Comprised of 4 half gram sun grown prerolls and an indoor Tarantula. Each pack contains the following... 5 pre-rolls: *Zen (green) indica dominant – Sedating and relaxing effects. *Inspire (orange) hybrid – Exploring the balance of head and body effects. *Awake (yellow) sativa dominant – Uplifting and cerebral effects. *Heal (purple) CBD Strain – Meticulously crafted for an array of head and body effects. *Evolve (blue) – GanjaGold’s Tarantula: top shelf grade flower, hand painted with live resin Tarantula oil and dusted in our proprietary kief blend.